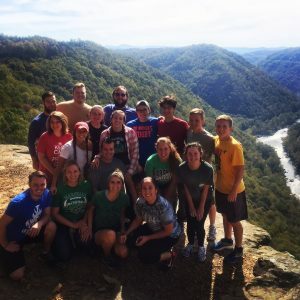 Welcome to University of Charleston Catholic Campus Ministry! Need some stress relief? Want to connect with God on a deeper level? The Saint John Paul II Center is welcome to all UC students and staff/faculty alike. We are located at the John Paul II Campus Ministry Center just 3 doors past the UC Pharmacy School. The center provides a place to study, share a meal, make friends and foster a deeper relationship with God. We have a beautiful chapel, quiet study room, and comfortable family room with all the amenities of home. This is quite literally a home away from home for students. Our trip with Marshall CCM to the Gorge!